​Chris Humphrey is a singer, a pianist, a composer, an arranger, a lyricist, and, within the Seacoast jazz community, is considered a local treasure. 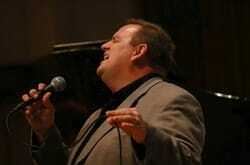 Best known as a jazz vocalist, Chris’s primary focus is the use of the voice as an instrument. His skills as an improviser and interpreter of song have been showcased on a number of recordings, early among them the album Almost Blue by the vocal group The Ritz, of which he was a member. The album featured Chris’s singing, composing, and arranging talents. More recently, his album Nothing But Blue Sky (Cadence Jazz Records) was met with overwhelmingly positive critical response. Recorded with award-winning drummer Matt Wilson and Martin Wind (who comprise 2/3 of the Bill Mays trio) and Boston-based Mark Shilansky on piano, Humphrey blended energetic fresh arrangements with originality and sincerity. The Chris Humphrey Big Band (14 pieces) is a classic big jazz band that features tunes from 1930s to the 1960s. Stylistically, the band emulates the Count Basie Orchestra but also play tunes made famous by Duke Ellington, Woody Herman, Stan Kenton, Buddy Rich, Frank Sinatra, Michael Buble and Glenn Miller. Click here for more about Chris Humphrey.